//Sub/Corpus Blog: Now … Get 50GB from Box.net for free for life !!! 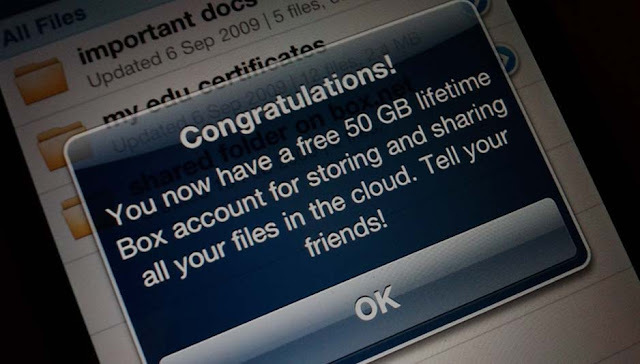 Now … Get 50GB from Box.net for free for life !!! I've always shared here with you whenever I got to know about good online file storage services. I've written on this blog about Upload Robots, Dropbox and quite recently about Minus. I've had a Box account for a few years now. It gave me 5GB of free space to start with. But last night, I got to know that if your create a new account on Box with an iOS device or log on to your existing Box account with an iOS device, you would immediately get 50GB of space for free, for life! That is good news for iOS guys, but what about us with Android devices? Well, I tried with my Google Nexus S, and guess what, nothing happened. Android users have been miserably left in the cold for this one. I don't know why, maybe Box wants compete with iCloud. So, I did what everybody would do in a situation like this. I borrowed a friend's iPhone4, logged on to my Box account, and bam! I now have 50GB for free for life. I can use it however I please. Remember, Box.net is only running this until *December 2nd* this year, and you don't have to have an iOS device to use the free space. If you are on Android or using any other platform, just ask a friend to let you use his/her iOS device to log on to your Box account just once or to create an account on Box. Thats it, you will not need the iOS device anymore. What are you waiting for? Back up your files now! Enjoy your free space! This must be some really good milk !!! If your website does this, then damn you !!! … and I am a proud father !!! Goodbye, Steve ... you'll be missed !! !